What changes in hurricane activity are expected for the late 21st century, given the pronounced global warming scenarios from IPCC models? Have humans already caused a detectable increase in Atlantic hurricane activity or global tropical cyclone activity? Sea level rise – which very likely has a substantial human contribution to the global mean observed rise according to IPCC AR5 – should be causing higher storm surge levels for tropical cyclones that do occur, all else assumed equal. Tropical cyclone rainfall rates will likely increase in the future due to anthropogenic warming and accompanying increase in atmospheric moisture content. 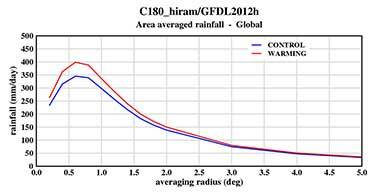 Modeling studies on average project an increase on the order of 10-15% for rainfall rates averaged within about 100 km of the storm for a 2 degree Celsius global warming scenario. Tropical cyclone intensities globally will likely increase on average (by 1 to 10% according to model projections for a 2 degree Celsius global warming). This change would imply an even larger percentage increase in the destructive potential per storm, assuming no reduction in storm size. Storm size responses to anthropogenic warming are uncertain. The global proportion of tropical cyclones that reach very intense (Category 4 and 5) levels will likely increase due to anthropogenic warming over the 21st century. There is less confidence in future projections of the global number of Category 4 and 5 storms, since most modeling studies project a decrease (or little change) in the global frequency of all tropical cyclones combined. In terms of detection and attribution, much less is known about hurricane/tropical cyclone activity changes, compared to global temperature. In the northwest Pacific basin, there is emerging evidence for a detectable poleward shift in the latitude of maximum intensity of tropical cyclones, with a tentative link to anthropogenic warming. In the Atlantic, it is premature to conclude with high confidence that human activities–and particularly greenhouse gas emissions that cause global warming–have already had a detectable impact on hurricane activity. A recent study finds that the observed increase in an Atlantic hurricane rapid intensification metric (1982-2009) is highly unusual compared to one climate model’s simulation of internal multidecadal climate variability, and is consistent in sign with that model’s expected long-term response to anthropogenic forcing. Reduced aerosol forcing since the 1970s probably contributed to the increased Atlantic hurricane activity since then, but the amount of contribution, relative to natural variability, remains uncertain. There is some evidence for a slowing of tropical cyclone propagation speeds globally over the past half century, but these observed changes have not yet been confidently linked to anthropogenic climate change. Human activities may have already caused other changes in tropical cyclone activity that are not yet detectable due to the small magnitude of these changes compared to estimated natural variability, or due to observational limitations. Observed records of Atlantic hurricane activity show some correlation, on multi-year time-scales, between local tropical Atlantic sea surface temperatures (SSTs) and the Power Dissipation Index (PDI) — see for example Fig. 3 on this EPA Climate Indicators site. PDI is an aggregate measure of Atlantic hurricane activity, combining frequency, intensity, and duration of hurricanes in a single index. Both Atlantic SSTs and PDI have risen sharply since the 1970s, and there is some evidence that PDI levels in recent years are higher than in the previous active Atlantic hurricane era in the 1950s and 60s. Model-based climate change detection/attribution studies have linked increasing tropical Atlantic SSTs to increasing greenhouse gases, but proposed links between increasing greenhouse gases and hurricane PDI or frequency has been based on statistical correlations. The statistical linkage of Atlantic hurricane PDI to Atlantic SST suggests at least the possibility of a large anthropogenic influence on Atlantic hurricanes. If this statistical relation between tropical Atlantic SSTs and hurricane activity is used to infer future changes in Atlantic hurricane activity, the implications are sobering: the large increases in tropical Atlantic SSTs projected for the late 21st century would imply very substantial increases in hurricane destructive potential–roughly a 300% increase in the PDI by 2100 (Figure 1a). On the other hand, Swanson (2008) and others noted that Atlantic hurricane power dissipation is also well-correlated with other SST indices besides tropical Atlantic SST alone, and in particular with indices of Atlantic SST relative to tropical mean SST (e.g., Figure 1b from Vecchi et al. 2008). This is in fact a crucial distinction, because while the statistical relationship between Atlantic hurricanes and local Atlantic SST shown in the upper panel of Figure 1 would imply a very large increases in Atlantic hurricane activity (PDI) due to 21st century greenhouse warming, the alternative statistical relationship between the PDI and the relative SST measure shown in the lower panel of Figure 1 would imply only modest future long-term trends of Atlantic hurricane activity (PDI) with greenhouse warming. In the latter case, the alternative relative SST measure in the lower panel does not change very much over the 21st century, even with substantial Atlantic warming projections from climate models, because, crucially, the warming projected for the tropical Atlantic in the models is not very different from that projected for the tropics as a whole. A key question then is: Which of the two future Atlantic hurricane scenarios inferred from the statistical relations in Figure 1 is more likely? To try to gain insight on this question, we have first attempted to go beyond the ~50 year historical record of Atlantic hurricanes and SST to examine even longer records of Atlantic tropical storm activity and second to examine dynamical models of Atlantic hurricane activity under global warming conditions. These separate approaches are discussed below. To gain more insight on this problem, we have attempted to analyze much longer (> 100 yr) records of Atlantic hurricane activity. 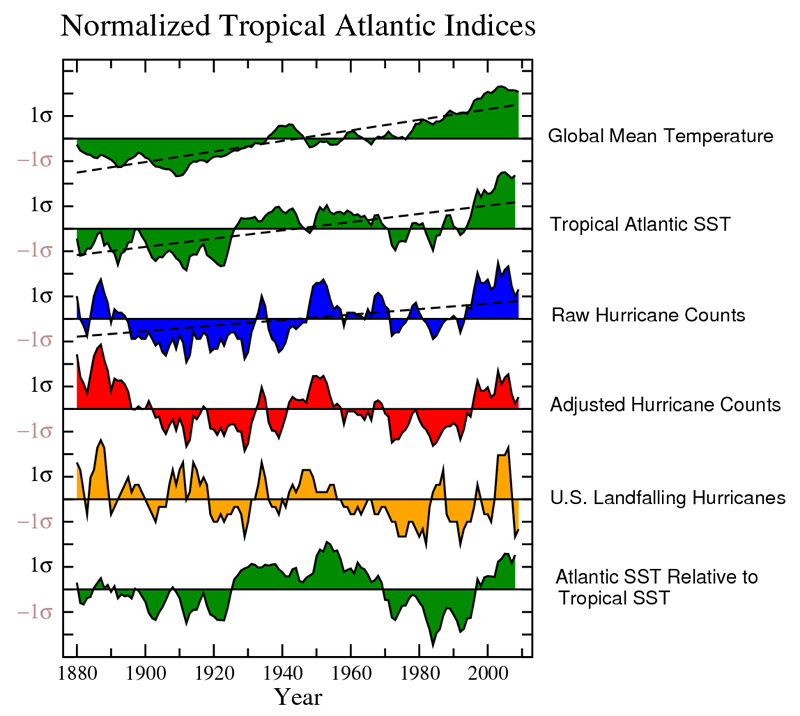 If greenhouse warming causes a substantial increase in Atlantic hurricane activity, then the century scale increase in tropical Atlantic SSTs since the late 1800s should have produced a long-term rise in measures of Atlantic hurricanes activity, similar to that seen for global temperature, for example. not significantly distinguishable from zero (Figure 2). In addition, Landsea et al. (2010) note that the rising trend in Atlantic tropical storm counts is almost entirely due to increases in short-duration (<2 day) storms alone. Such short-lived storms were particularly likely to have been overlooked in the earlier parts of the record, as they would have had less opportunity for chance encounters with ship traffic. CCSP 3.3 (2008)). This is without any adjustment for “missing hurricanes”. The evidence for an upward trend is even weaker if we look at U.S. landfalling hurricanes, which even show a slight negative trend beginning from 1900 or from the late 1800s (Figure 3, blue curve). Hurricane landfalling frequency is much less common than basin-wide occurrence, meaning that the U.S. landfalling hurricane record, while more reliable than the basin-wide record, suffers from degraded signal-to-noise characteristics for assessing trends. 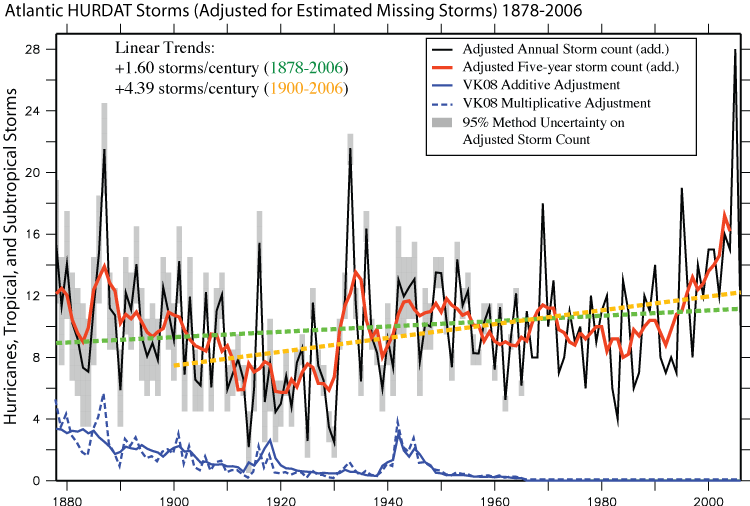 While major hurricanes (Figure 3, red curve) show more evidence of a rising trend from the late 1800s, the major hurricane data are considered even less reliable than the other two records in the early parts of the record. Category 4-5 hurricanes show a pronounced increase since the mid-1940s (Bender et al., 2010) but again, we consider that these data need to be carefully assessed for data inhomogeneity problems before such trends can be accepted as reliable. The situation for various long-term Atlantic hurricane records and related indices is summarized in Figure 4. While global mean temperature and tropical Atlantic SSTs show pronounced and statistically significant warming trends (green curves), the U.S. landfalling hurricane record (orange curve) shows no significant increase or decrease. 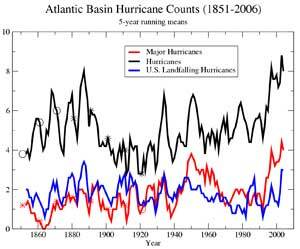 The unadjusted hurricane count record (blue curve) shows a significant increase in Atlantic hurricanes since the early 1900s. However, when adjusted with an estimate of storms that stayed at sea and were likely “missed” in the pre-satellite era, there is no longer any significant increase in Atlantic hurricanes since the late 1800s (red curve). 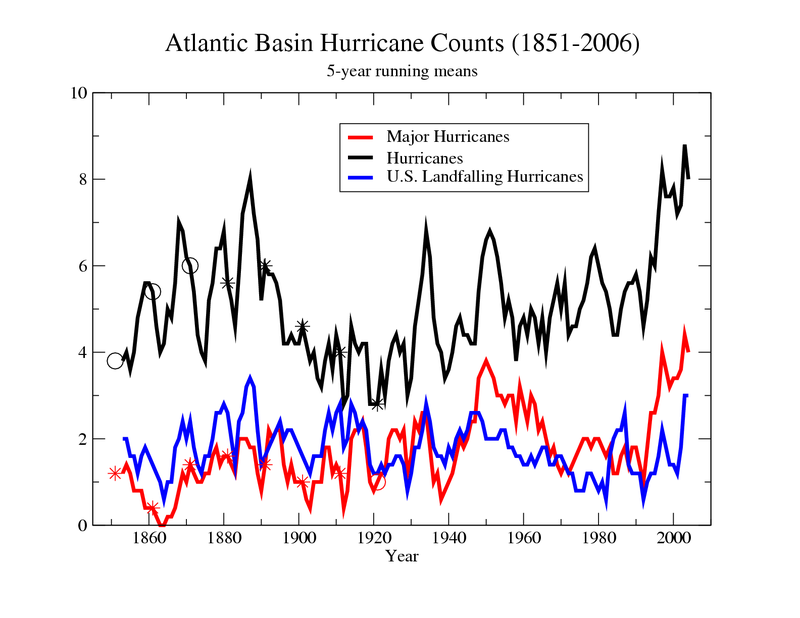 While there have been increases in U.S. landfalling hurricanes and basin-wide hurricane counts since the since the early 1970s, Figure 4 shows that these recent increases are not representative of the behavior seen in the century long records. In short, the historical Atlantic hurricane frequency record does not provide compelling evidence for a substantial greenhouse warming-induced long-term increase. such as the AMO. In addition, the anthropogenic forcing link was explored in the HiFLOR simulations in only a very preliminary way. More climate models should be tested and further research pursued on the sources of Atlantic multidecadal variability in order to increase confidence in those conclusions. The mechanisms of observed Atlantic multidecadal variability and its simulation in climate models continues to be an active research topic in the field of climate change. There is medium confidence for a detectable human contribution to past observed increases in heavy precipitation in general over global land regions with adequate coverage for analysis (e.g., IPCC AR5) and over the United States (Easterling et al. 2017), although an anthropogenic influence has not been formally detected for hurricane precipitation alone. Several recent studies (e.g., van Oldenborgh et al. 2017; Risser and Wehner 2017) have concluded that Hurricane Harvey’s (2017) extreme rainfall totals, though primarily due to the storm’s slow movement over eastern Texas, were likely enhanced by anthropogenic warming. Physically, a warmer atmosphere holds more water vapor that can enhance moisture convergence and rainfall rates in storm systems such as hurricanes. The statistical analyses in these Hurricane Harvey studies focused on extreme precipitation in general, to which hurricanes contributed, but were not analyses of extreme rainfall only from hurricanes. Direct model simulations of hurricane activity under climate change scenarios offer another perspective on the problem. 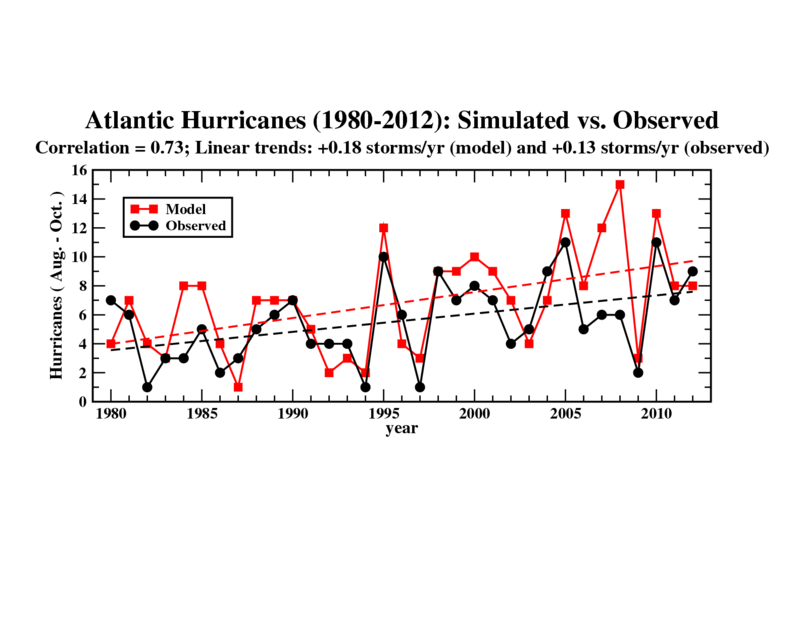 We have developed a regional dynamical downscaling model for Atlantic hurricanes and tested it by comparing with observed hurricane activity since 1980. 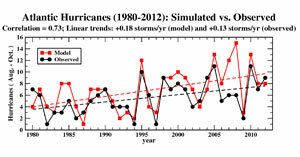 This model, when forced with observed sea surface temperatures and atmospheric conditions, can reproduce the observed rise in hurricane counts between 1980 and 2012, along with much of the interannual variability (Figure 5). Animations showing the development and evolution of hurricane activity in the model are available here. Turning to future climate projections, current climate models suggest that tropical Atlantic SSTs will warm dramatically during the 21st century, and that upper tropospheric temperatures will warm even more than SSTs. Furthermore, most of the CMIP3 models project increasing levels of vertical wind shear over parts of the western tropical Atlantic (see Vecchi and Soden 2007). Both the increased warming of the upper troposphere relative to the surface and the increased vertical wind shear are detrimental factors for hurricane development and intensification, while warmer SSTs favor development and intensification. To explore which effect of these effects might “win out”, we can run experiments with our regional downscaling model. Knutson and Tuleya (2004) estimated the rough order of magnitude of the sensitivity of hurricanes to climate warming to be about 4% per deg C SST warming for maximum intensities and about 12% per deg C for near-storm (100 km radius) rainfall rates (see also Knutson and Tuleya (2008) abstract here). Such sensitivity estimates have considerable uncertainty, as a subsequent assessment of multiple studies (Knutson et al. 2010) projected total increases by 2100 of about 2-11% for tropical cyclone intensity, and roughly 20% for near-storm rainfall rates. Our more recent late 21st century projections of hurricane activity continue to support the notion of increased intensity (~ 4%) and near-storm rainfall rates (~ 10 to 15%) for the Atlantic basin (Knutson et al. 2013) as well as for most other tropical cyclone basins (Knutson et al. 2015). Wright et al. (2015) found model-projected increases in rainfall rates for U.S. landfalling tropical cyclones using this modeling system. Turning now to the question of the frequency of very intense hurricanes, the regional model of Knutson et al. 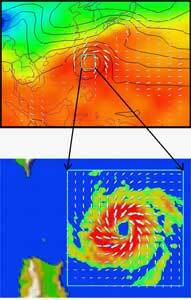 (2008) has an important limitation in that it does not simulate such very intense hurricanes. For example, the maximum surface wind in the simulated hurricanes from that model is less than 50 m/s (which is borderline category 3 hurricane intensity). Furthermore, the idealized study of Knutson and Tuleya (2004) assumed the existence of hurricanes and then simulated how intense they would become. Thus, that study could not address the important question of the frequency of intense hurricanes. In a series of Atlantic basin-specific dynamical downscaling studies (Bender et al. 2010; Knutson et al. 2013), we attempted to address both of these limitations by letting the Atlantic basin regional model of Knutson et al. (2008) provide the overall storm frequency information, and then downscaling each individual storm from the regional model study into the GFDL hurricane prediction system. The GFDL hurricane model (with a grid spacing as fine as 9 km) is able to simulate the frequency, intensity, and structure of the more intense hurricanes, such as category 3-5 storms, much more realistically than the regional (18 km grid) model. Using this additional downscaling step, the GFDL hurricane model reproduces some important historical characteristics of very intense Atlantic hurricanes, including the wind speed distribution and the change of this distribution between active and inactive decadal periods of hurricane activity (Fig. 1 of Bender et al. 2010). The model also supports the notion of a substantial decrease (~25%) in the overall number of Atlantic hurricanes and tropical storms with projected 21st century climate warming. However, using the CMIP3 and CMIP5 multi-model climate projections, the hurricane model also projects that the lifetime maximum intensity of Atlantic hurricanes will increase by about 5% during the 21st century in general agreement with previous studies. The Bender et al. (2010) study projected a significant increase (+90%) in the frequency of very intense (category 4 and 5) hurricanes using the CMIP3/A1B 18-model average climate change projection. Subsequent downscaled projections using CMIP5 multi-model scenarios (RCP4.5) as input (Knutson et al. 2013) still showed increases in category 4 and 5 storm frequency (Fig. 7). However, these increases were only marginally significant for the early 21st century (+45%) or the late 21st century (+39%) CMIP5 scenarios (based on model versions GFDl and GFDN combined). That study also downscaled ten individual CMIP3 models in addition to the multi-model ensemble, and found that three of ten models produced a significant increase in category 4 and 5 storms, and four of the ten models produced at least a nominal decrease. While multi-model ensemble results are probably more reliable than individual model results, each of the individual model results can be viewed as at least plausible at this time. Based on Knutson et al. (2013) and a survey of subsequent results by other modeling groups, at present we have only low confidence for an increase in category 4 and 5 storms in the Atlantic; confidence in an increase in category 4 and 5 storms is higher at the global scale (see below). control climate (upper left); CMIP3/A1B 18-model ensemble late 21st century (lower left); and CMIP5/RCP4.5 18-model ensemble early (upper right) or late (lower right) 21st century. All results shown are based on model version GFDL. Track colors indicate the intensity category during the storm’s lifetime. there is little evidence from current dynamical models that 21st century climate warming will lead to large (~300%) increases in tropical storm numbers, hurricane numbers, or PDI in the Atlantic. As noted above, there is some indication from high resolution models of substantial increases in the numbers of the most intense hurricanes even if the overall number of tropical storms or hurricanes decreases. Finally, one can ask when a large increase in Category 4-5 hurricanes, as projected by our earlier Bender et al. (2010) study, would be expected to be detectable in the Atlantic hurricane records, if it occurred in the real world. Owing to the large interannual to decadal variability of SST and hurricane activity in the basin, Bender et al (2010) estimate that detection of an anthropogenic influence on intense hurricanes would not be expected for a number of decades, even assuming a large underlying increasing trend (+10% per decade) occurs. While there is a large rising trend since the mid 1940’s in observed category 4-5 numbers in the Atlantic, our view is that these data are not reliable for trend calculations, until they have been further assessed for data homogeneity problems, such as those due to changing observing practices. Apart from greenhouse warming, other human influences conceivably could have contributed to recent observed increases in Atlantic hurricanes. For example, Mann and Emanuel (2006) hypothesize that a reduction in aerosol-induced cooling over the Atlantic in recent decades may have contributed to the enhanced warming of the tropical North Atlantic, relative to global mean temperature. However, the cause or causes of the recent enhanced warming of the Atlantic, relative to other tropical basins, and its effect on Atlantic tropical cyclones, remains highly uncertain (e.g., Booth et al. 2012; Zhang et al. 2013; Dunstone et al. 2013; Villarini and Vecchi 2013). A number of anthropogenic and natural factors (e.g., aerosols, greenhouse gases, volcanic activity, solar variability, and internal climate variability) must be considered as potential contributors, and the science remains highly uncertain in these areas. IPCC AR5 concluded that there is medium confidence that reduced aerosol forcing contributed to the observed increase in Atlantic tropical cyclone activity since the 1970s, but does not state any estimate of the magnitude of contribution. They also conclude that it remains uncertain whether there are any detectable changes in past tropical cyclone activity. Sea level rise must also be considered as a way in which human-caused climate change can impact Atlantic hurricane climate–or at least the impacts of the hurricanes at the coast. The vulnerability of coastal regions to storm-surge flooding is expected to increase with future sea-level rise and coastal development, although this vulnerability will also depend upon future storm characteristics, as discussed above. All else equal, tropical cyclone surge levels should increase with sea level rise. There are large ranges in the 21st century projections for both Atlantic hurricane characteristics and for the magnitude of regional sea level rise along the U.S. coastlines. 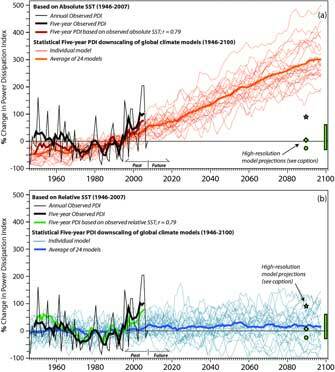 However, according to the IPCC AR5, the average rate of global sea level rise over the 21st Century will very likely exceed that observed during 1971-2010 for a range of future emission scenarios. In summary, neither our model projections for the 21st century nor our analyses of trends in Atlantic hurricane and tropical storm activity support the notion that greenhouse gas-induced warming leads to large increases in either tropical storm or overall hurricane numbers in the Atlantic. While one of our modeling studies projects a large (~100%) increase in Atlantic category 4-5 hurricanes over the 21st century, we estimate that such an increase would not be detectable until the latter half of the century, and we still have only low confidence that such an increase will occur in the Atlantic basin, based on an updated survey of subsequent modeling studies by our and other groups. A recent study finds that the observed increase in an Atlantic hurricane rapid intensification metric over 1982-2009 is highly unusual compared to one climate model’s simulation of internal multidecadal climate variability, and is consistent in sign with that model’s expected long-term response to anthropogenic forcing. These climate change detection results for rapid intensification metrics are suggestive but not definitive, and more research is needed for more confident conclusions. Therefore, we conclude that it is premature to conclude with high confidence that human activity–and particularly greenhouse warming–has already caused a detectable change in Atlantic hurricane activity. (“Detectable” here means the change is large enough to be distinguishable from the variability due to natural causes.) 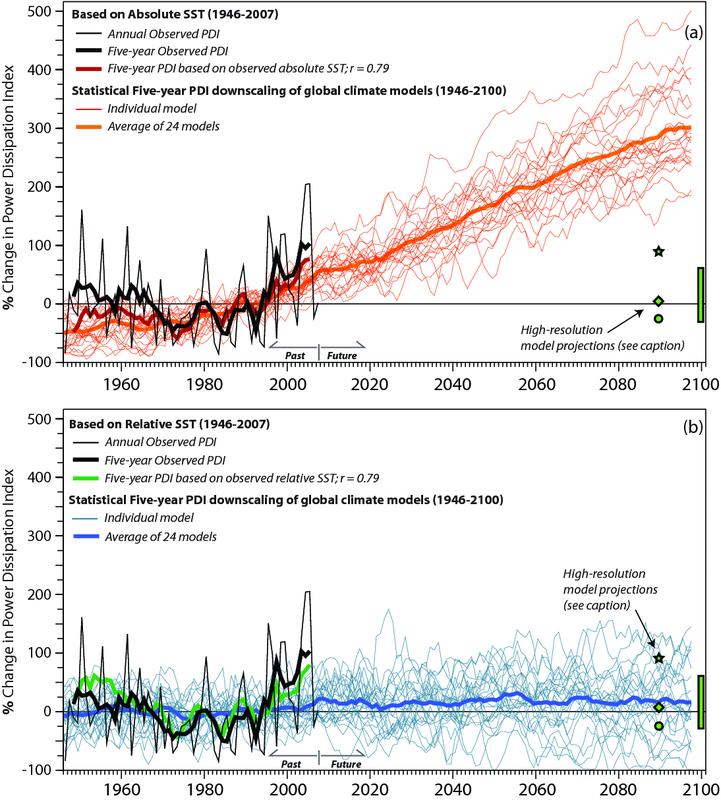 However, human activity may have already caused some some changes that are not yet confidently detectable due to the small magnitude of the changes or observation limitations, or due to limitations in modeling and physical understanding (e.g., aerosol effects on regional climate, uncertainties in simulation of Atlantic multidecadal variability). We also conclude that it is likely that climate warming will cause Atlantic hurricanes in the coming century have higher rainfall rates than present-day hurricanes, and medium confidence that they will be more intense (higher peak winds and lower central pressures) on average. In our view, it is uncertain how the annual number of Atlantic tropical storms will change over the 21st century. All else equal, tropical cyclone surge levels should increase with sea level rise as projected for example by IPCC AR5. These assessment statements are intended to apply to climate warming of the type projected for the 21st century by prototype IPCC mid-range warming scenarios, such as A1B or RCP4.5. The relatively conservative confidence levels attached to our tropical cyclone projections, and the lack of a claim of detectable anthropogenic influence on tropical cyclones at this time contrasts with the situation for other climate metrics, such as global mean temperature. In the case of global mean surface temperature, the IPCC AR5 presents a strong body of scientific evidence that most of the global warming observed over the past half century is very likely due to human-caused greenhouse gas emissions. The main focus of this web page is on Atlantic hurricane activity and global warming. However, an important question concerns whether global warming has or will substantially affect tropical cyclone activity in other basins. In terms of historical tropical cyclone activity, recent work (Kossin et al. 2014; see GFDL Research Highlight; Kossin et al. 2016) indicates that the latitude at which the maximum intensity of tropical cyclones occurs has expanded poleward globally in recent decades. The poleward shift in the Northwest Pacific they conclude is unusual compared to expected variability from natural causes but consistent with general expectations of such a shift due to anthropogenic warming seen in climate model experiments. The poleward shift has been found in both hemispheres, but is not seen in the Atlantic basin. Human activities may have already caused other changes in tropical cyclone activity that are not yet detectable due to the small magnitude of these changes compared to estimated natural variability, or due to observational limitations. For future projections, GFDL atmospheric modelers have developed global models capable of simulating many aspects of the seasonal and year-to-year variability of tropical cyclone frequency in a number of basins, using only historical sea surface temperatures as input. Examples of the performance of these models on historical data are provided on this web page. Our 2015 study examines the impact of 21st-century projected climate changes (CMIP5, RCP4.5 scenario) on a number of tropical cyclone metrics, using the GFDL hurricane model to downscale storms in all basins from one of the lower resolution global atmospheric models mentioned above. 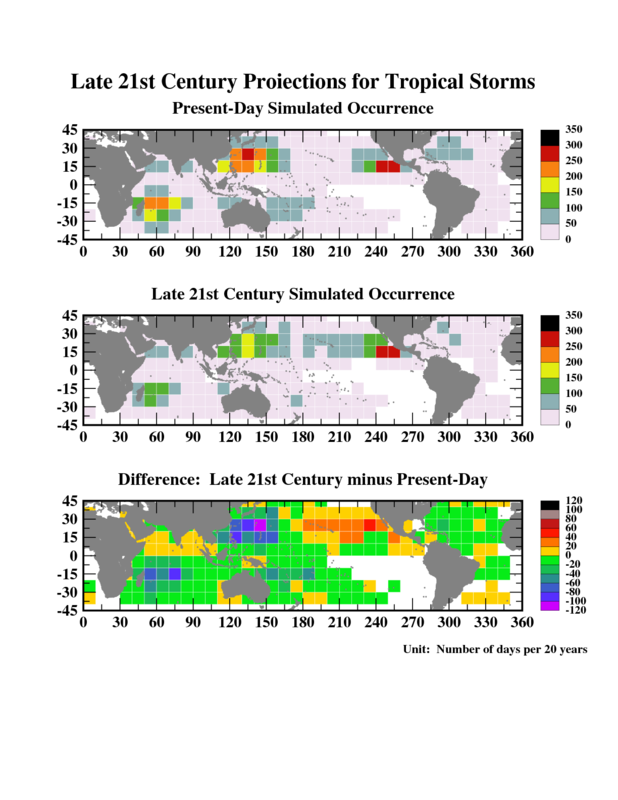 Key findings from these experiments include: fewer tropical cyclones globally in a warmer late-twenty-first-century climate (Figure 8), but also an increase in average cyclone intensity, the number and occurrence days of very intense category 4 and 5 storms in most basins (Figure 9) and in tropical cyclone precipitation rates (Figure 10). These global-scale changes are not necessarily projected to occur in all tropical cyclone basins. 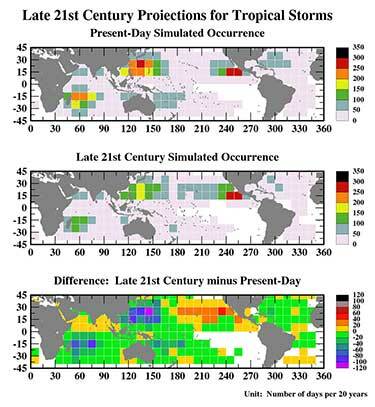 For example, our 2015 study projects an increase in tropical storm frequency in the Northeast Pacific and near Hawaii, and a decrease in category 4-5 storm days over much of the southern hemisphere basins and parts of the northwest Pacific basin–both at variance with the global-scale projected changes. These differences in responses between basins seem to be linked to how much SSTs increase in a given region compared to the tropical mean increase in SST. Basins that warm more than the tropical average tend to show larger increases in tropical cyclone activity for a number of metrics. 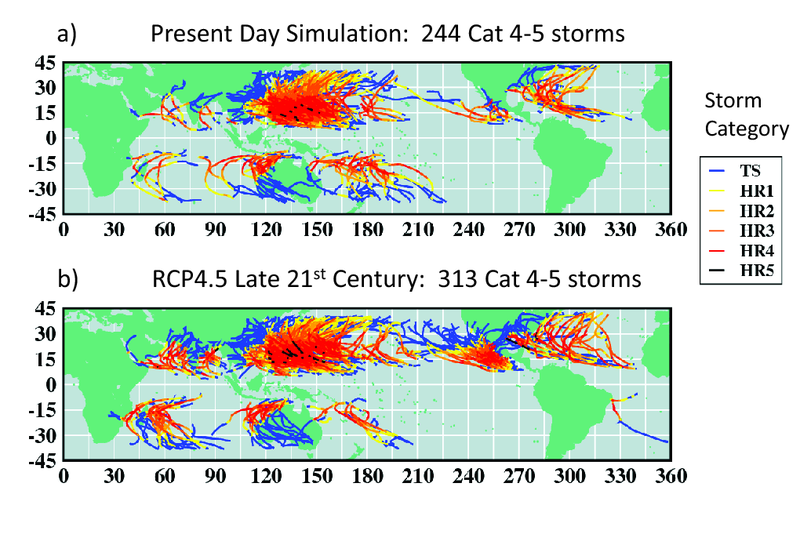 Our 2015 study simulations also project little change in the median size of tropical cyclones globally; the model shows some skill at simulating the differences in average storm size between various basins in the present-day climate, lending some credibility to its future climate change projections of tropical cyclone size. Increasing frequency of extremely severe cyclonic storms over the Arabian Sea (Murakami, Vecchi, and Underwood) Nature Climate Change, 2017, 7(12), DOI: 10.1038/s41558-017-0008-6 . Future changes in tropical cyclone activity in high-resolution large-ensemble simulations. (Yoshida, K, M Sugi, R Mizuta, Hiroyuki Murakami, and M Ishii,) 2017: Geophysical Research Letters, 44(19), DOI: 10.1002/2017GL075058 . Western North Pacific tropical cyclone model tracks in present and future climates. (Nakamura, J, S J Camargo, A Sobel, N Henderson, K A Emanuel, A Kumar, T LaRow, Hiroyuki Murakami, M Roberts, E Scoccimarro, P L Vidale, H Wang, M F Wehner, and Ming Zhao), 2017: Journal of Geophysical Research, 122(18), DOI: 10.1002/2017JD027007 . Projection of future changes in the frequency of intense tropical cyclones. (Sugi, M, Hiroyuki Murakami, and K Yoshida), 2017: Climate Dynamics, 49(1-2), DOI: 10.1007/s00382-016-3361-7 . Global Projections of Intense Tropical Cyclone Activity for the Late Twenty-First Century from Dynamical Downscaling of CMIP5/RCP4.5 Scenarios (Knutson, et al. ), J. Climate, Sept. 2015. Investigating the Influence of Anthropogenic Forcing and Natural Variability on the 2014 Hawaiian Hurricane Season. (Murakami, H., et al. ), 2015: Bulletin of the American Meteorological Society, 96(12), DOI: 10.1175/BAMS-EEE_2014_ch23.1 . Influences of Natural Variability and Anthropogenic Forcing on the Extreme 2015 Accumulated Cyclone Energy in the Western North Pacific [in “Explaining Extremes of 2015 from a Climate Perspective”], (Zhang, W. et al.) 2016: Bulletin of the American Meteorological Society, 97(12), DOI: 10.1175/BAMS-D-16-0146.1 S131-S135. Simulation and Prediction of Category 4 and 5 Hurricanes in the High-Resolution GFDL HiFLOR Coupled Climate Model. (Murakami, H., et al.) 2015: Journal of Climate, 28(23), DOI: 10.1175/JCLI-D-15-0216.1. Regional climate model projections of rainfall from U.S. landfalling tropical cyclones. (Wright, Knutson, and Smith), Climate Dynamics, 2015. Dynamical Downscaling Projections of Twenty-First-Century Atlantic Hurricane Activity: CMIP3 and CMIP5 Model-Based Scenarios, J. Climate 2013. TC-permitting GCM simulations of hurricane frequency response to sea surface temperature anomalies projected for the late 21st century. J. Climate 2012. How well do we know past Atlantic hurricane activity? 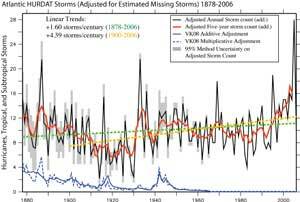 A web site on adjusting for “missing storms” in the past Atlantic hurricane data. Simulations of global hurricane climatology, interannual variability, and response to global warming using a 50km resolution GCM. J. Climate, 2009. “Tropical Cyclones and Climate Change”, an assessment by a World Meteorological Organization Expert Team on Climate Change Impacts on Tropical Cyclones is now available. This assessment was published in Nature Geoscience (March 2010). For more information on the expert team, see this WMO web page. This report assesses published research on “Tropical Cyclones and Climate Change” from the international scientific literature. The strongest hurricanes in the present climate may be upstaged by even more intense hurricanes over the next century as the earth’s climate is warmed by increasing levels of greenhouse gases in the atmosphere. Although we cannot say at present whether more or fewer hurricanes will occur in the future with global warming, the hurricanes that do occur near the end of the 21st century are expected to be stronger and have significantly more intense rainfall than under present day climate conditions. This expectation (Figure 11) is based on an anticipated enhancement of energy available to the storms due to higher tropical sea surface temperatures. The results shown in Figure 11 are based on a simulation study carried out by Thomas R. Knutson and Robert E. Tuleya at NOAA’s Geophysical Fluid Dynamics Laboratory (GFDL). In this study hurricanes were simulated for a climate warming as projected to occur with a substantial build-up of atmospheric CO2. An increase of intensity of about one-half category on the Saffir-Simpson scale was simulated for an 80 year build-up of atmospheric CO2 at 1%/yr (compounded). For hurricane wind speeds, our model shows a sensitivity of about 4% per degree Celsius increase in tropical sea surface temperatures, with a larger percentage increase in near-storm rainfall. An increase in the upper-limit intensity of hurricanes with global warming was suggested on theoretical grounds by M.I.T. Professor Kerry Emanuel in 1987. In the late 1990s, Knutson, Tuleya, and Kurihara at GFDL/NOAA began simulating samples of hurricanes from both the present-day climate and from a greenhouse-gas warmed climate. 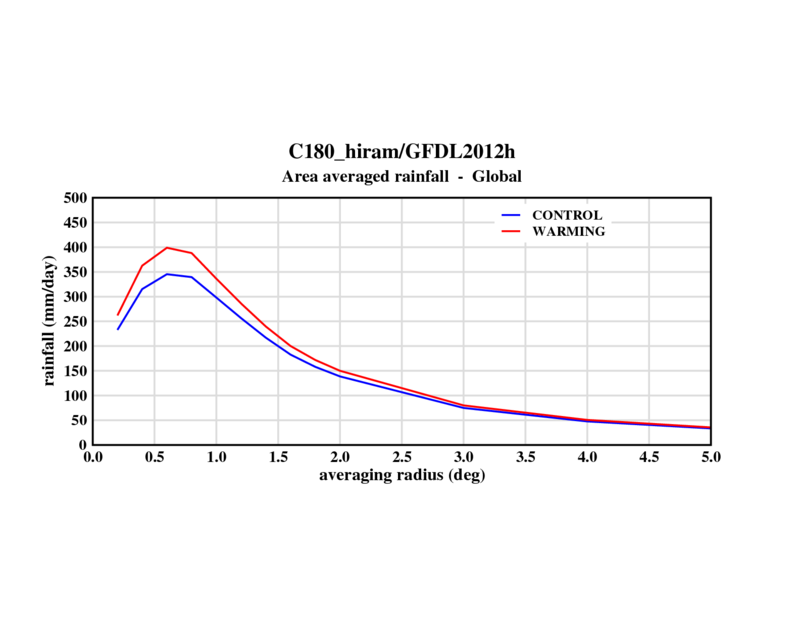 This was done by “telescoping-in” on coarsely resolved tropical storms in GFDL’s global climate model using the high-resolution GFDL hurricane prediction model (Figure 12). A research report describing this work was published in Science (1998), with a more detailed paper in Climate Dynamics (1999, vol. 15). All of these studies, as well as our more recent ones, include the moderating effect of atmospheric stabilization aloft under high CO2 conditions, rather than simply increasing the sea surface temperature alone. In a follow-up study, which appeared in the Journal of Climate(2001), NOAA scientists Knutson and Tuleya teamed up with Isaac Ginis and Weixing Shen of the University of Rhode Island to explore the climate warming/ hurricane intensity issue using hurricane model coupled to a full ocean model. 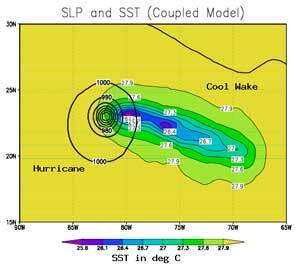 The coupled model was used to simulate the “cool SST wake” generated by the hurricanes as they moved over the simulated ocean (Figure 13). The model simulations including this additional feedback still showed a similar percentage increase of hurricane intensity under warm climate conditions as the original model without ocean coupling. 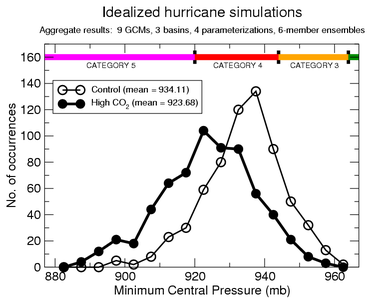 A comprehensive idealized hurricane intensity modeling study by Knutson and Tuleya, published in Journal of Climate (2004), confirms the general conclusions of previous studies but makes them more robust by using future climate projections from nine different global climate models and four different versions of the GFDL hurricane model. The GFDL hurricane model used for the study is an enhanced resolution version of the model used to predict hurricanes operationally at NOAA’s National Centers for Environmental Prediction. According to this latest study, an 80 year build-up of atmospheric CO2 at 1%/yr (compounded) leads to roughly a one-half category increase in potential hurricane intensity on the Saffir-Simpson scale and an 18% increase in precipitation near the hurricane core. A 1%/yr CO2 increase is an idealized scenario of future climate forcing. As noted by the Intergovernmental Panel on Climate Change (IPCC), there is considerable uncertainty in projections of future radiative forcing of earth’s climate. A criticism of our paper by Michaels et al. is responded to here. An implication of the GFDL studies is that if the frequency of tropical cyclones remains the same over the coming century, a greenhouse-gas induced warming may lead to an increasing risk globally in the occurrence of highly destructive category-5 storms. “Tropical Cyclones and Climate Change”, an assessment by a World Meteorological Organization Expert Team on Climate Change Impacts on Tropical Cyclones. For more information on the expert team, see this WMO web page. Future projections of global tropical cyclone activity (J. Climate 2015). Future projections of intense Atlantic hurricanes (J. Climate 2013). 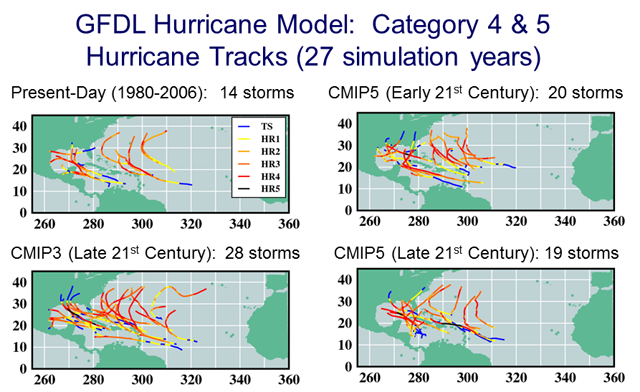 Global models of hurricane frequency developed at GFDL. Historical changes in Atlantic hurricanes and tropical storms. GFDL Climate Research Highlights web page.